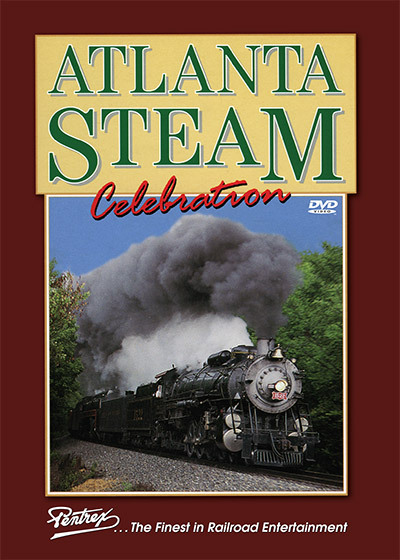 The haunting sounds of steam locomotives echoed once again through the Deep South when the National Railway Historical Society held its 1994 National Convention in Atlanta, Georgia. Enthusiasts rode excursion trains pulled by the Frisco 1522 and the N&W 611, or cheered trackside as these two powerful steam locomotives thundered by. Pentrex was on the spot as official videographer to record all of the convention's exciting events for your enjoyment. The nonstop railroading action was highlighted by fantastic doubleheaders of the Frisco 1522 and the N&W 611. The 1522 impressed the crowds with its "loud bark" as it doubleheaded with the 611 from Birmingham, Alabama, to Atlanta, Georgia, and later from Atlanta to Chattanooga, Tennessee. N&W 611, with its streamlined looks and matching maroon passenger cars, evoked visions of the past as it raced by small towns and scenic countryside. New Georgia Railroad's vintage diesels added to the entertainment as they pulled a dinner train to Stone Mountain, while Norfolk Southern diesels joined the steam locomotives on "rare mileage" trips over former Southern Railway, Central of Georgia, and L&N lines. At Norfolk Southern's McDonough training center, we tour the locomotive simulator, signalmen training and state-of-the-art welding centers. View the freight and locomotive repair areas, and watch as visitors are treated to a ride on the center's 9-mile training track. Award Value: 124 Points Earn points for free DVDs. Signup free. Joshua Craig Beytien (Iowa) on 2018-05-08 18:15:54. I found the first-time double-header involving a 'Northern' and a 'Mountain' a reminding flashback to most railfans who've liked it as they had when they were children long ago. chris collins (fletcher north carolina) on 2017-11-08 23:16:08. BigJim4Life (Bucks County, PA) on 2017-06-17 09:37:33. This is one of the better Pentrex videos that I've seen. There is a lot of action featured, with both Frisco #1522 and N&W #611 getting their share of screen time. There is just enough of the other convention activities covered to break things up a bit and provide a very nice overview of the entire event. Steamboy (Revere MA US) on 2018-02-11 07:24:22. Almost 25 years into the new decade, this was the final NRHS Convention for the Original NS Steam Program. It's also a sequel to the Frisco 1522 Peach Blossom Special Video. Unfortunately, this one didn't have any chapter menus whatsoever. You'll have to watch the program just like when it debut on VHS back when it first arrived.